Use a clean soft cloth a mixture with a few drops of mild liquid dishwashing detergent and warm water (too much detergent may leave a film & cause streaks) or a 3-n-1 Natural Stone Cleaner. Paramount Marble & Granite recommends and keeps in our inventory 3-n-1 Natural Stone Cleaner. It’s important to follow the manufactures instructions carefully. Rinse the countertop thoroughly after washing with the soap solution and dry with a clean soft cloth. If you spill something on your counter top, blot with a paper towel or soft cloth immediately. Do not wipe the area as this can spread the spill. Flush the spill with warm water and detergent and rinse thoroughly. Dry the area with a soft cloth. Properly sealed stone will repel most stains if the spills are cleaned promptly. Keep the stone surface clean. This will ensure that it is always easier to clean, when stains are attended to promptly. 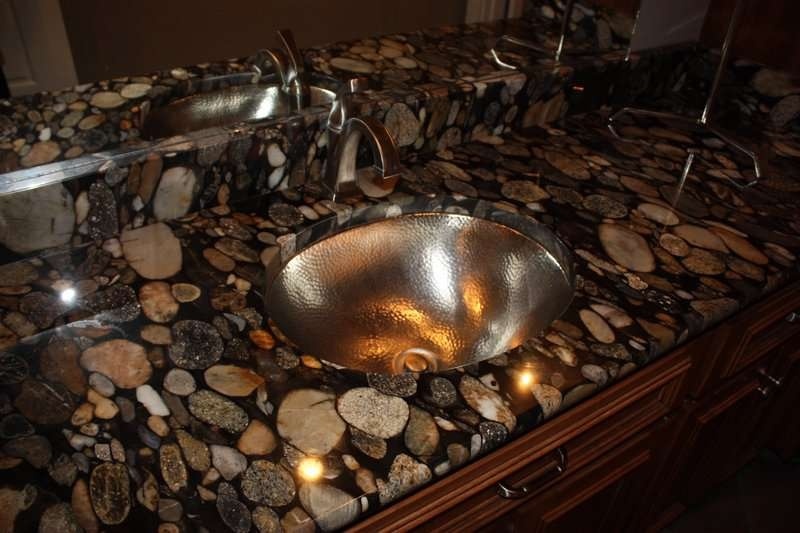 Do NOT use general household products not specifically designed for natural stone countertops. Do not use products that contain lemon, vinegar, or other acids because they may dull the countertop, break down the sealer, and/or etch the countertop. Do NOT stand on your natural stone countertops. Do NOT beat or bang pots on natural stone countertops. Always have supports/corbels where there is an overhang greater than 6 inches. Give your home the elegant look with services from Paramount Granite & Marble in Valdosta, GA. We specialize in natural stone and quartz countertops. Benefit from our lifetime warranty. Get in touch with us today!